Stanley C. Wallace (1895- ?) was an organist who, during the 1920's toured around the world. He was closely related to the Wurlitzer company. He was invited by the SF company and contracted for the period August 1926 to January 1927. The contract stated that he should play at the daily shows and also provide education for local organists. 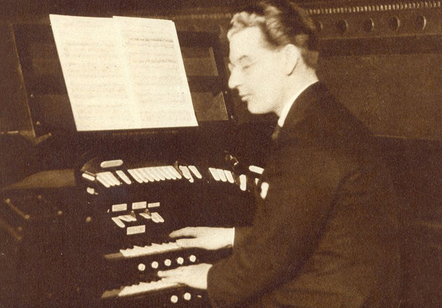 Gösta Hådell (1903-1975) had a solid musical education and was widely known as organist, conductor and arranger. He didn't stay very long at Skandia. John Malm (1901-1965) became the principal organist from 1927 and onward. He made the organ known to the general audience and made several radio broadcasts and records. 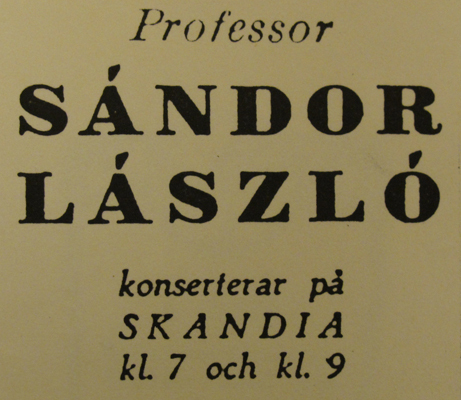 Sándor László (1895-1970) was a concert pianist and composer. He played the Wurlitzer during some weeks in the spring of 1928. In the autumn of 1929 the first Swedish talkie, ”Konstgjorda Svensson”, was released and more followed quickly. This made the organ redundant. But the Wurlitzer wasn't completely silenced. 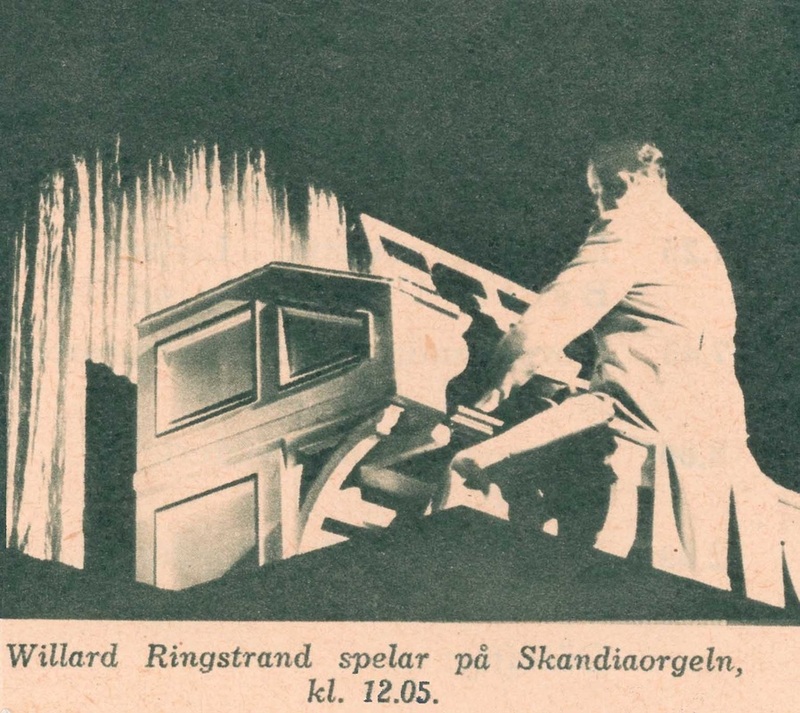 In October 1937 organist Gösta Berlin (1898-1952) played several popular tunes in when a new Swedish film was shown. Also in February 1938 Frithof Staerke played daily before and after the show when the American version of the operetta ”Rose-Marie” was shown. In 1942 the organ was deemed unplayable after years of neglect. 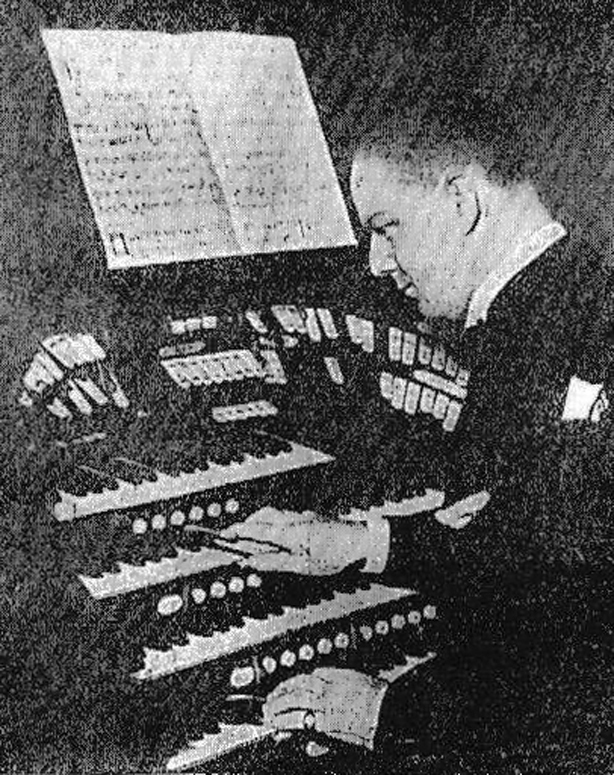 But it was decided to restore the function and organ builder Hans C. Schuster (1888-1970) was selected for the task. He came from and organ building family and had emigrated to the USA and was quite acquainted with Wurlitzer technology. He had returned to Sweden in 1938. No functional changes were made, only necessary repairs. The most striking changes were made to the console, it was painted white and gold. The console was moved to the center of the orchestra pit and put on an elevator. The film company decided that the Wurlitzer was too good to sit unused. Willard Ringstrand (1908-1973) Boxing day 1943 SF Film company starts a new idea with about 5 minutes of playing before the main film starts. 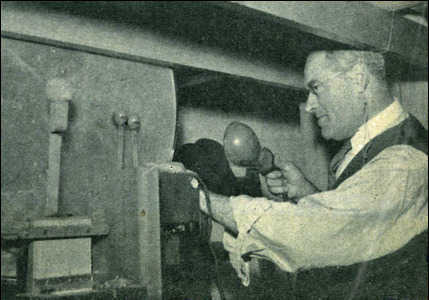 On the bench is Mr. Willard Ringstrand in white tails and a spotlight directed to the console. In the 1940's there was a new generation moviegoers who didn't know about a Wurlitzer. Mr. Ringstrand's program was a success. More people learned about the organ through many radio broadcasts. 1944-1949 the organ was heard more than 60 times in various radio programs. 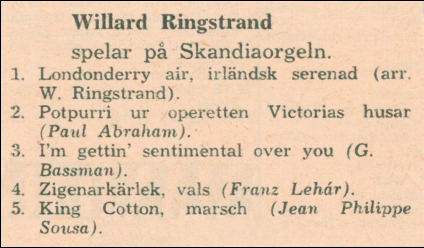 Mr. Ringstrand also made several records. 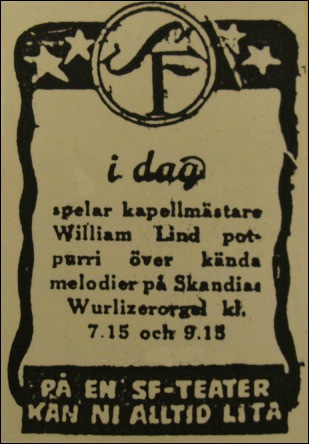 ​William Lind (1911-1995) was at the time a well known conductor and arranger of light orchestra music. He made a few concerts at the Wurlitzer. Sofar the SF Film company had only hired established and well educated musicians to play the Wurlitzer. In the autumn of 1945 they decided to try something new. Ulf Wesslén (1927-2009) was only 18 years old when he was hired as organist. He played during 1946/47. His engagement came to an abrupt end when his organ teacher heard about his engagement. Combining jazz and popular music with studies in classical organ was unthinkable. Ralph Åke Levén (1930-2015) was called in 1947 to succeed Wesslén. He was also very young, only 17. This was a start of a long and successful career as a concert organist. But his engagement was cut short. In autumn of 1948 the SF Company decided to end playing before the beginning of the film. They claimed it was too expensive and showing commercials was a better deal. 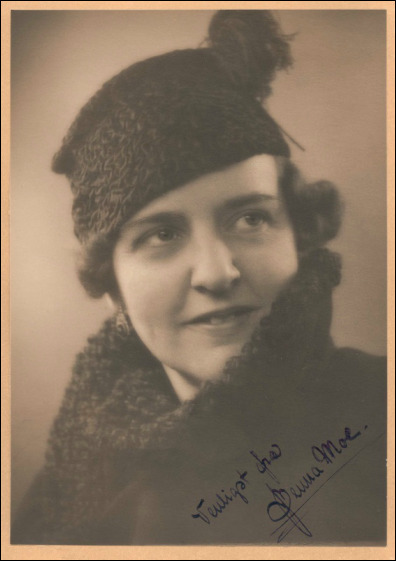 Benna Moe was born in Copenhagen and had studied organ, song and composition at "Det Kungl. Danska musikkonservatoriet". She often visited Sweden and was living here a few years during the 1940's. After WW2 she returned to Copenhagen and played 1948-50 at the Palladium Wurlitzer (Opus 2220). In June of 1951 she played several concerts on the Skandia Wurlitzer. It was a big success and the engagement was extended by two weeks. Parts of the concerts were recorded for example Tea for Two, Donkey Serenade, Salut d'amour, and The Parade of the Tin Soldiers. This was probably the last time the Wurlitzer was played publicly from its original place. The Wurlitzer was removed around 1968. The theater was renovated and equipped with new technology. It was also renamed to "Look". The organ was bought by the City of Stockholm and later installed in the City Hall. It was used as a spare organ while the original organ, Walcker Opus 2073 (click), was undergoing a major restoration. Toy counter and other effects were not installed but stored in the attic. The Wurlitzer was not used for concerts, only incidental music.